When the St. Louis Cardinals presented Stephen Piscotty with a position switch from third base to the outfield, he prepared for it the old-fashioned way. He took his bat and glove and went out in the yard with his dad. "He hit me a bunch of fungoes, a couple buckets every day," Piscotty said of his offseason work with his father, Mike, who's been a constant source of baseball advice for Piscotty since he was kid. "I think a lot of guys in pro ball get bogged down with tiny mechanical things. He breaks it down and keeps it simple." A Stanford product and former Cape Cod League batting champ, Piscotty earned a promotion to Springfield in June after hitting .292 in 63 games at Class A Advanced Palm Beach. He's played exclusively in right field this season and has yet to make an error in 23 Double-A games after committing just one miscue in the Florida State League. Piscotty, 22, was St. Louis' first-round supplemental pick last season, the 36th overall selection in the Draft. Going from the Cardinal to the Cardinals was simply going from one demanding program to another. "It's military-like [at Stanford]," said Piscotty, an All-Pac-12 player who hit .319 during his final season. "Very strict, hard-nosed baseball, and I think it's a good carryover into pro ball." A pitcher and shortstop at Amador Valley High in Pleasanton, Calif., the right-handed Piscotty played third, outfield and even pitched at Stanford, going 5-2 with a 2.57 ERA in 2012. Playing for such a program helped prepare Piscotty for the Cardinals, whose winning tradition is apparent in their 11 World Series victories. "At Stanford it was all about winning, and they preach it here in the Cardinals organization," said Piscotty, whose three-year batting average at Stanford was .340. "They say, 'We don't apologize for a winning culture.'" 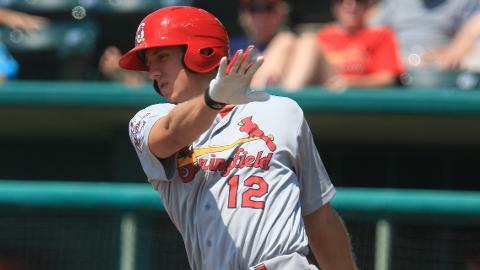 Piscotty feels his college experience inspired St. Louis to start him at Class A Quad Cities last season -- not to mention his performance in the Cape Cod League, where he swung the wood bat to the tune of a .349 average with the Yarmouth-Dennis Red Sox in 2011. "I played some wood-bat ball before the Cape, and I had a tremendous liking for it," Piscotty said. "There's something about the wood bat. It's so true -- you couldn't get away with mishitting a ball like you can with an aluminum bat. It really fine-tunes your swing." The Cards may have solved the latter with the position switch, and Piscotty may be taking care of the former himself. He had nine homers to go with his 14 doubles in the Florida State League and has hit three long balls since arriving in the Texas League. "I'm very happy with my approach right now," said Piscotty, 6-foot-3 and 210 pounds. "Out of the gate in the Florida State League, I hit some home runs and showed I can do that. I stuck with my same approach. I'm actually hitting a few more homers. I'm just getting stronger and I got a lot of room to fill out and that's what the offseason is for." Card sharks: Springfield pitchers Anthony Ferrara, Kevin Thomas and Lee Stoppleman faced one batter over the minimum in a 4-0 victory at Arkansas on Saturday. Ferrara fanned nine over seven innings before Thomas and Stoppleman added one strikeout apiece. Angels prospect Kaleb Cowart picked up the Travelers' lone hit, a single to left field in the second inning. Double debuts: Corpus Christi lefty David Rollins made his Double-A debut Sunday after coming to the Houston organization in a 10-player trade with Toronto. Rollins went 5 2/3 innings against Midland and struck out six with one walk but did not factor in the decision. ... Texas prospect Luke Jackson made his Double-A bow with Frisco and pitched two scoreless innings of relief with four strikeouts in a 1-0 loss to San Antonio. Familiar face: Texas Rangers right-hander Colby Lewis made his fifth rehab start with Frisco on Saturday, yielding two runs over five innings before the RoughRiders beat San Antonio on Thomas Telis' 11th-inning sacrifice fly. It was the 10th extra-inning game of the season for both teams.